The Pretenders do what they do best on their newest album, Alone: combining a welcome mix of surf rock tones and classic rock energy. Chrissie Hynde and her bandmates have composed an impressive collection of songs that occupy many genres and convey many emotions. Ultimately, the album is a tremendous feat for The Pretenders, as they fuse their traditional garage rock sound with an experimental edge. Alone is full of rock ’n’ roll hits. Songs like “Roadie Man,” “Gotta Wait” and “Holy Commotion” serve as prime examples of The Pretenders’ ability to, well, rock hard. “Roadie Man” espouses clear surf rock elements, like its main guitar riff. Meanwhile, breaths can be heard in the background, helping infuse the musical atmosphere with an air of intimacy. Interestingly, the song’s vocals occur both in a rhythmic, spoken-word fashion as well as a more traditional melodic delivery. This unique vocal presentation helps form Hynde’s signature style, and has thus become a staple of The Pretenders’ sound. Ultimately, “Roadie Man” maintains a garage-rock, ’60s vibe, with tremolo guitar appearing halfway through the course of the song. Listeners are then placated by Chynde’s indifferent assertion, “whatever happens happens”– a true rock ’n’ roll sentiment. Similarly, “Gotta Wait,” features prominent guitars and carefree lyrics. A pounding snare, featured at the beginning of the song, is paired with a distorted, bluesy riff. “Gotta Wait” is one of those head-banging anthems, chock full of solo guitars and thick synth textures that fill out the sonic soundscape. Hynde sings, “you gotta wait on an oxycontin comedown / you gotta wait, alone and put your gun down.” Again, these lyrics describe the audacious reality of the rock ’n’ roll lifestyle. Finally, the last song on the album rocks in its own way. It opens with a classic rock drum beat, which is soon accompanied by sparkling piano notes. However, synthesizers and guitar powerfully assume the most dominant roles on this track. As Hynde sings, “holy commotion, I just want, I want, I want to see your face, to change your place,” pentatonic scale riffs flurry in the background. The song fades out with high energy, bringing it back to the rocking tones that characterized the beginning of the album. These songs clearly demonstrate The Pretenders’ ability to develop and utilize their traditional sound. Alone also features the use of acoustic guitar. Songs like “Let’s Get Lost” and “Blue Eyed Sky” show the band’s penchant for writing memorable melodic material. “Let’s Get Lost” begins with clean, arpeggiated electric guitars humming in the background, as tambourines beat out a rhythmic clave. This helps the song to establish a more relaxing tone, colored with classic rockabilly vibes. Hynde sings, “get close to you,” and the song definitely possesses a certain intimate quality that reiterates this lyric. In the background, a melodic steel guitar rings, capturing an island feel, which perhaps relates back to the title of the song–getting lost, as if stranded on a deserted island. “Blue Eyed Sky” is another example of The Pretenders’ ability to write classic, ballad-like songs. It opens with electronic sounds and acoustic fingerstyle guitar, which are set to a much slower tempo, reinforcing a sadder, more contemplative mindset. The finger picking is both melodic and textural, as a syncopated drum kit rhythm soon joins the mix. The bass is understated yet subtly necessary. Hynde sings, “he knows, he knows, my love overflows,” and the imagery prevalent in these lyrics is particularly captivating. The song then culminates with a natural crescendo, helping the island influence resonate into even the fading last notes of the song. Alone also boasts songs (e.g. “Never Be Together” and “Chord Lord”) that showcase the band’s ability to incorporate funk influences into their music. For instance, the bass line at the beginning of “Never Be Together” can best be described as “funky.” Meanwhile, upbeat guitars flow along with the rhythm section–a straight 4/4 drum beat with a very cool, clean vibe. Hynde sings, “walking through the city, hand in hand, those are things for lovers, do you understand that?” These haunting lyrics echo the main themes of the album: isolation and loneliness. Chordal guitar stabs ornament the song, whilst during certain harmonic transitions, the band toys with minor modes to alter the sound. A reverberated solo soon plays, showing off lead guitarist James Walbourne’s propensity to incorporate traditional surf-rock picking into a fundamentally original playing style. “Chord Lord” is a similarly funky song that begins with a heavy drum fill. The song occupies a much lower register than the album’s first four tracks, but it does offer some bluesy rock riffs that flurry throughout the background. Hynde occasional guttural cries reveal her frenzied emotional state: “can’t compete on the street, I haven’t got the heat / can’t keep up with the beat like I should.” “Chord Lord” is a catchy, poppy song, full of straining, reaching guitar solos that are heavily distorted, competing for the listener’s attention. The biggest accomplishment of the album comes in the form of “One More Day.” The song captures an exotic, Spanish vibe and features a prevalent rhythm section. Vocally, the song conveys Hynde’s pain and emotion, helping the track to resonate as one of the more captivating offerings on the album. Most notably, “One More Day” is a fusion of The Pretenders’ trademark sound and more regional sounds, as well as surf tones and melodies. Upright bass is also utilized, giving The Pretenders a complex sound, whilst simultaneously pushing them towards something new. 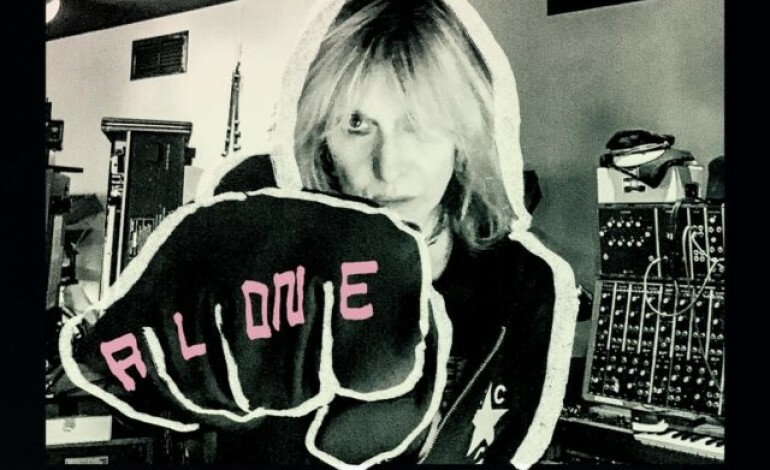 Clearly, Alone is proof that Hynde’s band is not afraid to push the limits of their sound.